We invite you to explore the following exclusive ADAA publications geared towards mental health students, trainees and professionals. Also listed here are two ADAA exclusive self-help publications we encourage you to share with clients. If you have any questions about these publications, please contact us. Order online and save 30%: Enter promo code ampromd9 at checkout. The Primer on Anxiety Disorders: Translational Perspectives on Diagnosis and Treatment provides early-stage practitioners and trainees—as well as seasoned clinicians and researchers—with need-to-know information designed to assist in the diagnosis and treatment of anxiety disorders. The translational approach is state-of-the-art for clinicians and basic scientists alike, and connects our empirically supported practices with the theoretical and neurobiological bases for them. 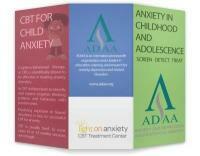 This volume is a project of the Anxiety and Depression Association of America (ADAA) members. To help better address these common and frequently comorbid conditions, Drs. Kerry J. Ressler, Daniel S. Pine, and Barbara Olasov Rothbaum compiled an expertly edited collection that provides mental health students, trainees, and professionals with the critical information they need, plus updates on new advancements in the field and illustrative clinical cases. Reid Wilson, PhD, sums up the fundamentals of tackling the most common condition confronting psychotherapists. In this lively new video, combining a live presentation with an accompanying case demonstration, he illustrates the core concepts of his groundbreaking technique and paradoxical twist in exposure therapy. Please allow 3-5 business days for delivery of the DVD. Thank you. Purchase the hard copy version. Limited availability. Please allow 3-5 business days for hard copy book deliveries. Thank you.